In this series of posts about an uncooperative African penguin, she retells one particular experience while conducting field research of wild penguins. Read Part 1 for an overview of the research project. Monday, February 23, 2009: It is 7:00 am and Katta and I just paddled to Halifax Island from Guano Bay on our paddle-skis, a 10 minute trip. The weather is still calm, but the south wind, for which this region is world-famous, is about to come up, making the paddle back to the mainland difficult, if not plain dangerous. We are scanning Penguin Colony 2 for a potential candidate to carry our GPS logger and settle for a penguin at the northern edge of the colony—easily accessible, in good condition, two healthy downy chicks. I leopard-crawl into the colony, trying not to upset the general peace, and slowly grab our penguin. An easy catch. 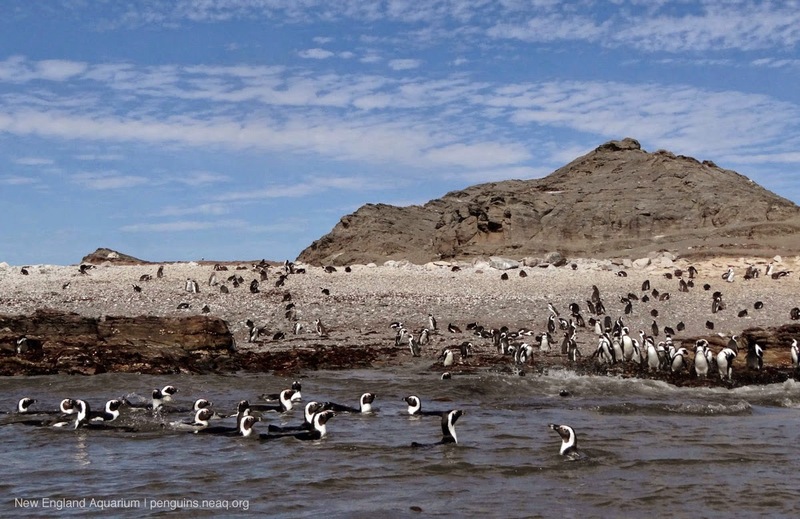 Halifax Island: Halifax Island in southern Namibia, home to about 6,000 African penguins. After retreating some 20 m from the colony, with my victim held securely under my arm, we quickly weigh and measure the bird, a female. While I gently but firmly hold the bird across my lap, her eyes covered, her heart racing, but not struggling to get away, Katta expertly fixes the small device to the lower back of the penguin by weaving strips of Tesa® tape into the feathers and wrapping the loose ends over the logger. The beauty of this method is that the logger can be taken off again without any damage to the feathers; that’s important because feather damage would compromise the bird’s waterproofing and therefore its survival, clearly not what we intend. The seawater will eventually take its toll on the effectiveness of the tape and after a week or so the tape will start to come apart. But that’s not a problem for us, because we will collect our logger again long before this becomes an issue. Five minutes later the logger is securely affixed and I release our penguin next to her nest. Usually a penguin quickly settles back at the nest with the chicks, breathes a sigh of relief and carries on contemplating life, but this time our bird just takes off, dashing through the colony, panic-stricken, away from me, away from her chicks. From a distance we watch the nest for a while, hoping our penguin would return, but she is nowhere to be seen. With the south wind picking up we decide to call it a morning and paddle back to land and a hot cup of tea. I am left with a niggling feeling that we have a particularly uncooperative bird on our hands. Catching her again to take the logger off might be tricky now that she knows what to expect. Keep reading with Part 3 of this series, where the researchers return to the island for their first attempt to retrieve the GPS logger. Things don't go entirely as planned!